Reptiles, being observed by divers are mostly members of the families of sea snakes and sea turtles. In contrast to their relatives on land, they are perfectly adapted to life in the oceans. Like their terrestrial counterparts, sea snakes are air breathers and therefore must periodically return to the surface. There is little information regarding their ability to stay submerged. Experts estimate that some species may remain submerged for several hours. In adaptation to locomotion under water , they have a flattened, paddle-shaped tail. Most sea snakes are relatively helpless and unable to strike on land. 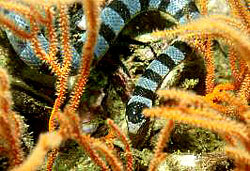 Sea snakes mainly feed on small fishes, moray eels and fish eggs. Although all sea snakes are highly poisonous they are no danger for divers and snorkelers, because they are completely non-aggressive. Most common sea snake of the Andaman Sea. In contrast to other sea snakes, which give birth to their young underwater, this species deposit eggs on land like most terrestrial snakes do. The turtles we see swimming over the reefs are very similar to ancestral forms 150 million years ago. Obviously these survivors are extremely well adapted for life in the oceans. Six of the eight species of marine turtles are found in the Indo-Pacific region. All are fully aquatic except for brief periods when females come ashore to deposit their eggs. Most migrate over long distances to reach favored breeding sites, in some case the same beach where they were hatched. Most turtles are mainly carnivorous, feeding on jellyfish, sponges, corals, crustaceans and small fish. Unfortunately, most sea turtles are highly endangered in their existence. In many areas their meat and eggs are utilized for food and their shells are shaped into bits of jewelry. Moreover, many turtles drown in trawl nets and also fall victim to plastic debris. 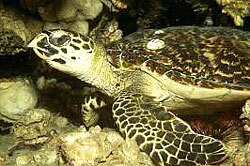 Most common turtle in the Andaman Sea. Easily identified by two pairs of scales between the eyes. This species is encountered all year round, specifically on dive sites around the Racha Islands.